It’s 1950. Two friends finally reach the green. They are evenly matched. A nickel rides on this hole alone. Not big money, just enough to buy a Coca-Cola. One ball likes two feet from the cup. The other ball lies three feet. Three-feet is away. He lines up his putt. He gets ready to swing. Why doesn’t Two-feet just mark his ball? What’s going on here? Why is Three-feet even putting? Three-feet swings (more of a small scooping chip) and pops his ball over Two-feet’s and right into the cup. It wasn’t until 1952 when the United States Golf Association finally agreed to change the rules and allow a player to mark their ball on the putting surface. Prior to this time, the above scenario probably would have happened — or the blocked party had the option of putting around it as well. 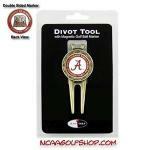 Once the new rule was engaged, it opened up a new market for new little gadgets in the world of golf. Rule 20-1: “The position of the ball to be lifted should be marked by placing a ball-marker, a small coin or other similar object immediately behind the ball.” Just what types of “other similar objects” does this rule talk about? 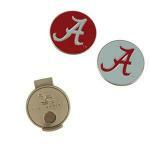 As you can see below, small metal objects can be more than just a substitute for a dime or quarter — they can be a great way to advertise your favorite golf course or show your favorite team spirit like with the Alabama Crimson Tide Hat Clip and Ball Marker. 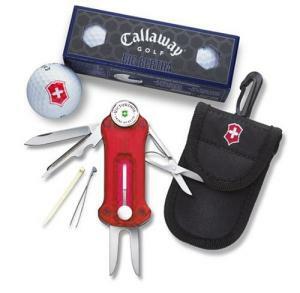 The ball marker also might be a part of a cooler “all-in-one tool” like the Victorinox Swiss Army Golf Tool. Oh sure, you can use the boring coin, or you can be cheap enough to use that little plastic one with a mini spike on the bottom that you found on the last green. 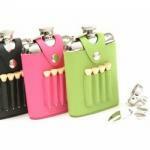 But wouldn’t it be better to pick up something that shows a little spirit? If that rule hit in 1952, I wonder how many markers were printed with “I like Ike” on them to campaign on the links?